Our Premium Foam Chaise Lounge Cushion Sets Are Made In The USA! When you want real luxury, choose a chaise lounge cushion set with a foam seat cushion. This chaise cushion set is made in two pieces. The back cushion, which is a fiber filled cushion which can be tufted and a seat cushion that is made using sold foam. The solid foam seat cushions will always have a zipper and removable cover. The back cushion can have a zippered removable cover with inner casings if you order it without tufts. Otherwise, tufted cushions can not have removable covers. The option for zippered back covers is available in the "Back Tufts" option. 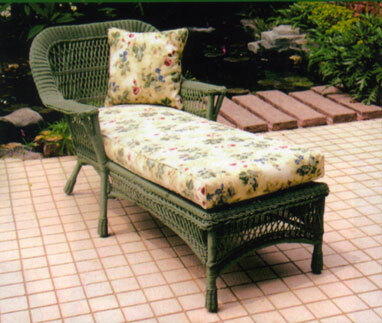 The four inch thick foam chaise lounge cushion is the most popular thickness for this cushion set. The thicker the seat cushion the better it feels. Select from four inch thick to six in thick foam for the seat cushion. The total thickness includes a one inch Dacron wrap around the top, face and bottom of the seat cushion to add softness and prevent the foam from wearing prematurely. View our Fabric Gallery for loads of fabrics to choose from for both indoor and outdoor use. Go to Tufted Chaise Lounge Cushion Set to shop for a chaise cushion set with a tufted seat cushion rather than a foam seat cushion.